Posted on 1/28/2019, 1:16 pm, by kittykill, under Meatless Monday. Everyone needs a little treat from time to time. You want to it to be healthy-ish but still have taste. No one wants to nibble on cardboard! Craftster member lindyv321 knows exactly what you need. 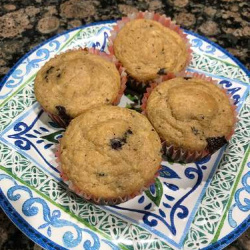 Her recipe for Peanut Butter and Banana Muffins will satisfy those cravings without all the processed sugar. These little gems are perfect any time of the day. Add blueberries or other fruit for a different flavor. You definitely won’t feel guilty about indulging your sweet tooth with a PB and Banana Muffin. You don’t have to sacrifice taste when you make delicious meals inspired by our Cooking Board. Have fun and create a new dish today!